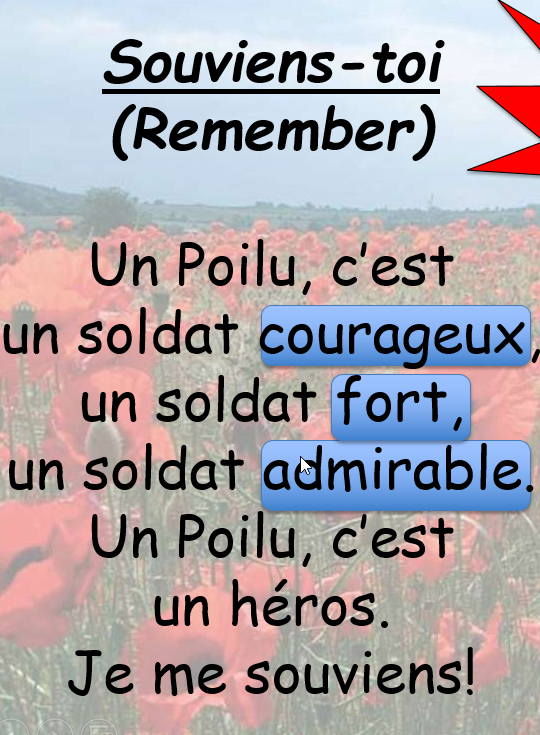 As Primary Languages Network we teach Primary French to thousands of children each week.Our “People Pillar Poems “ about soldiers in WW1 is enabling us this week(and possibly next) to explore with UKS2 language learners, “Remembrance of WW1” and “Armistice”. The activity is based upon the blog post I wrote in 2016, “People Pillar Poems “:nouns and adjectives to describe specific types of people and creatvely used in pillar like poems. 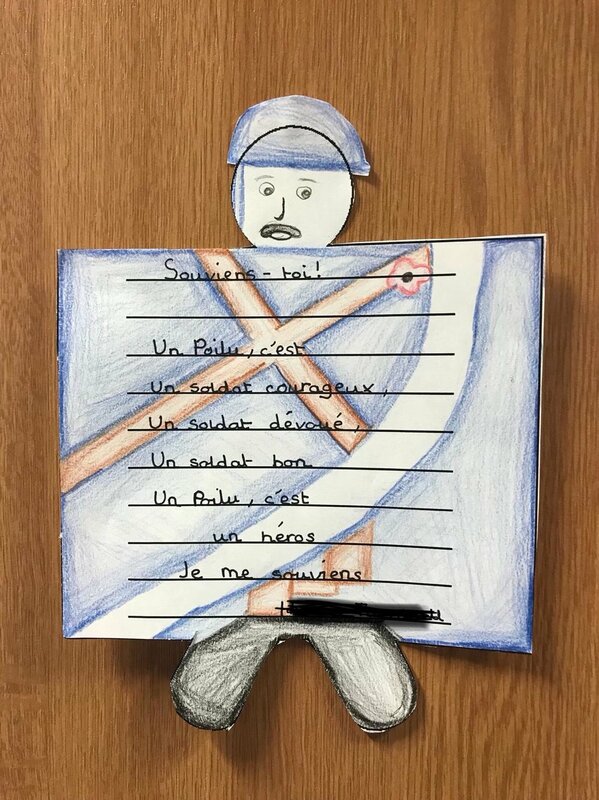 Our native French speaker associate teacher,Steph Pierre, used this blog post as a spring board to create a complete lesson powerpoint for all our Primary Languages Network teachers to use describing the soldiers (les poilus) in WW1. (If you are a network member then the whole resource is on the PLN VLE in Seasonal Specials Autumn 2).Below are some FREE materials from the resource that everyone can use to create their own people pillar poems. 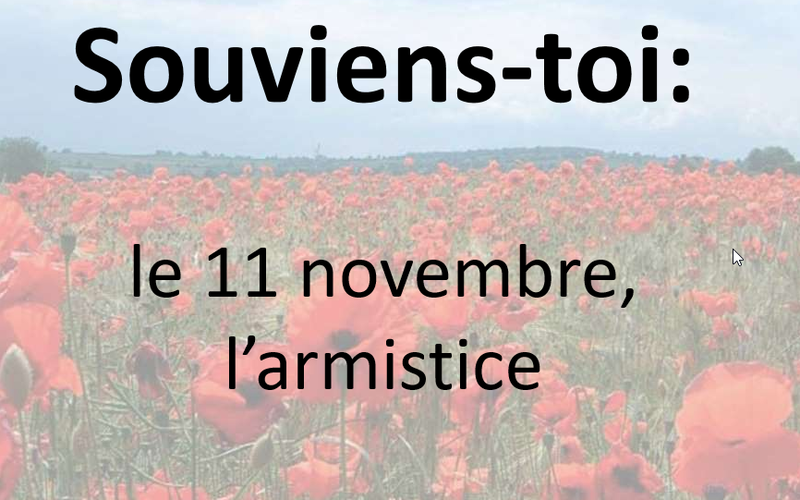 Share and discuss facts about Armistice. Use bilingual dictionaries to look up the highlighted adjectives and understand the simple poem about a soldier (slide above). Use the gap filler template below to write poems. Finally write out the poems and making a class display of the people pillar WW1 soldier poems they have created.In instances children are dedicating the poems to their own ancestors who fought in WW1.The template for the people pillar poem is in the blog post.Thanks to Clare Seccombe who created the template after I wrote the blog post. We hope you find this FREE activity useful . Newer PostIt's a Christmas Rescue!